Have you ever thought of adding crystals to your garden? Each type of crystal is said to harbor a unique energy & have a different type of power. 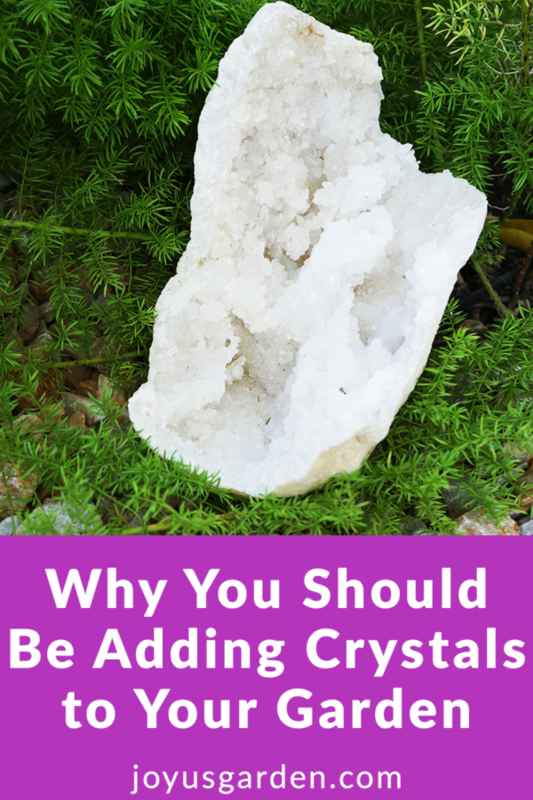 Find out how adding crystals can enhance your garden. Plus, they're downright pretty! Crystals come in many different bright and vibrant colors. 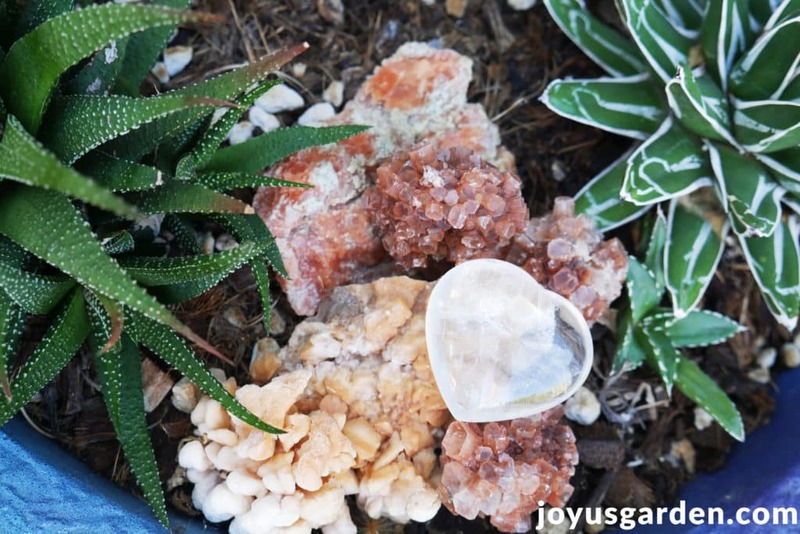 Placing these crystals amongst the flowers or plants can instantly improve the overall appearance of the garden. To make your garden turn heads, choose gemstones with colors that complement their surroundings. Citrine looks heavenly when it is nestled in a bed of yellow or white flowers, whereas malachite complements pink and purple flowers. If you thought the garden was beautiful before, wait until you see what it looks like once the crystals have been added. Multiple semi-precious gemstones: quartz, obsidian, rose quartz, etc. Every type of crystal is said to harbor a unique type of energy. 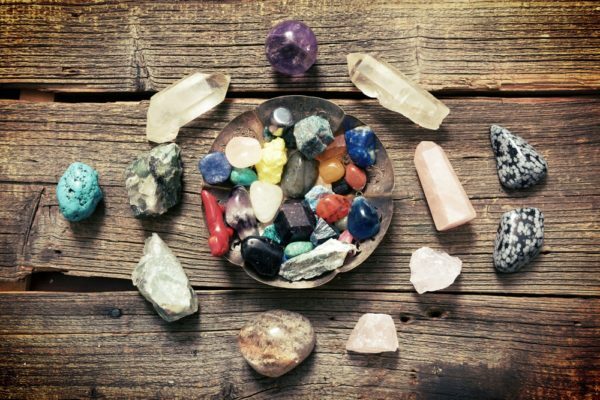 Throughout history, various cultures from around the world have used the energy from crystals to heal aches and pains, ward off negativity, and promote positive thinking. If the energy from crystals can be used to heal the human body, think of the wonders it can do to the plants and flowers in a garden! Each crystal has a different kind of power. The key to channeling the energy of crystals is choosing the right one for your garden’s needs. The tree agate crystal is supposed to encourage abundance, so it’s ideal for gardeners who want their plants to look fuller. If plants appear weak, the energy from green calcite can help these plants relax and regain their strength. Gardeners who are struggling to keep pests away from their prized plants should consider using onyx or another dark-colored crystal. Take the time to learn about each crystal so you can choose the ones that will benefit your garden the most. A clear quartz crystal heart nested in between a haworthia & an agave. Adding Crystals to Your Garden is Simple. There are several ways to use crystals to improve your garden. Many gardeners choose to simply place the crystals at the base of the plant so the roots feel the energy emitted from the sparkling stone. Gardeners also have the option of putting the crystal in a shallow hole within the dirt so it can make direct contact with the plant’s roots. But, some gardeners don’t want to hide the beauty of their crystals by tucking them underneath the plant or putting them in the ground. Instead, these gardeners use crystals to form a decorative pattern around or throughout their garden. The easiest way to do this is to use the crystals to create a shimmering border around the perimeter of your garden. While you’re here, check out this post on other things you should consider when planning your garden. 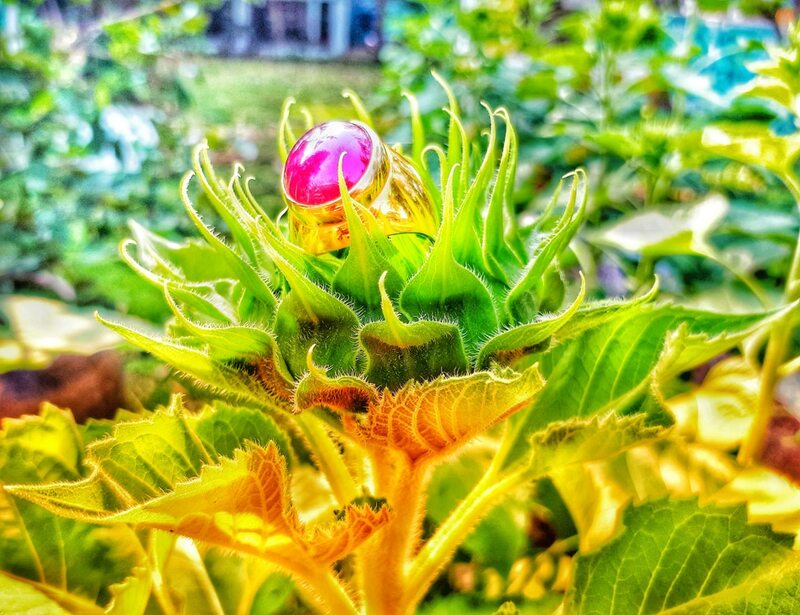 A ring placed on a blooming sunflower. Another way to transfer the energy of crystals into your garden is to place them in plant food. Let the crystals remain in the plant food for 24 hours. Then you can remove them and spread the plant food throughout your garden. Crystals come from the earth, so they won’t look out of place within your garden. Use these crystals to enhance the natural beauty of your garden and keep your plants healthy and strong. Adding crystals to your garden is so simple, and it looks wonderful too! Gwen Lewis is a writer who lives in California. She has been in the health and lifestyle industry for years. Gwen loves writing on this topic to give tips from experience. In her free time, she loves to stay active and has just taken on learning how to surf.